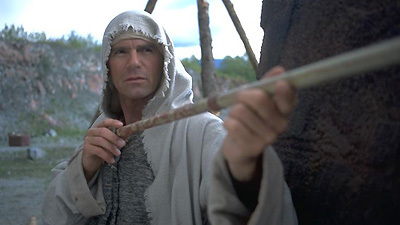 When SG-9 is declared missing in action, SG-1 is sent on a rescue mission to P3X-513.There they find a world with deadly solar radiation and the primitive cave-dwelling inhabitants worshipping SG-9 leader Captain Jonas Hanson as a god. Hanson believes in his own divinity, and even Captain Carter, who was once romantically linked with him, is unable to break his harsh rule. SG-1 must use his own technological discovery against him to help the people overthrow his ruthless grip, and to restore the solar shield that will allow them to safely live in the light. SG-1's mission was to rescue SG-9: Hanson, Baker, Conner, Frakes. Only Lt. Conner survived. Jonas Hanson had been previously engaged to Carter. Many worlds were terraformed by the Goa'uld. An energy force shield from a pair of Goa'uld devices turns the sky orange and protects against solar radiation. So, any indigenous lions, tigers or bears I should lie awake worrying about?